Owning a car is not as simple as it seems as it not only requires you to fill up the tank and drive, but also needs to be taken good care of. In order to keep your car well maintained, you would have to make sure you change the oil at the right time, take it to the mechanic for bi or tri-monthly check-ups and keep it polished and waxed. For most issues that may arise in your car, you might not want to take it to the mechanic, but work on it yourself instead. When it comes to working on your car, you may need different sets of tools for fixing different problems. It is extremely important that you have the right set of tools at your disposal. Using damaged or inadequate tools can lead to a number of problems, which include a lot of time being wasted, frustration, broken car parts and even severe injuries to the DIY-er. There have been a number of reported cases of serious accidents while working on cars and most of these accidents were caused by using worn-out tools. This is why it is highly recommended that you buy the best tools for your car to ensure maximum safety and convenience. 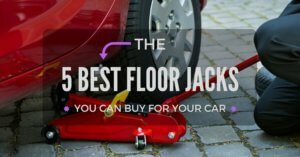 A floor jack is one the most important and commonly used tools and is found in almost every car. 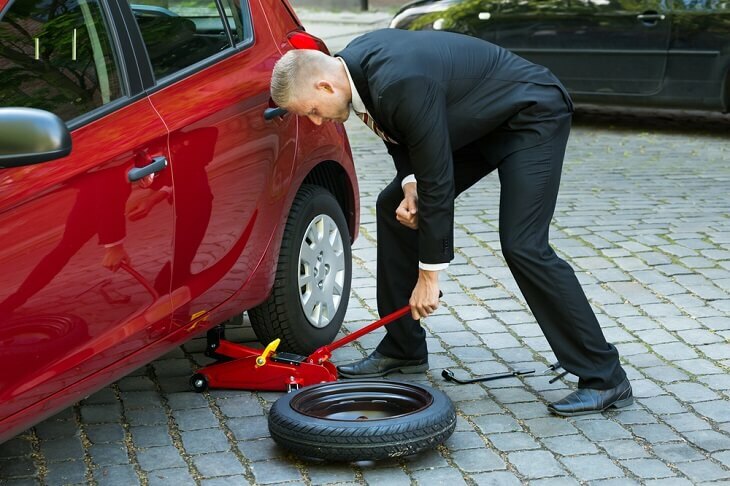 While they are used for changing tires most of the time, they are also used for a number of other purposes. Some tasks would require you to lift your car up using a floor jack and crawl under it. There are generally two different types of floor jacks available in the market. The most commonly used ones are aluminum jacks. Aluminum jacks have been used for decades and have been heavily relied on. Not only they are easy to use, but they also come with affordable price tags. They have a compact shape, which makes it easier for us to keep them in the trunk of the car. Aluminum jacks are also quite easy to use. 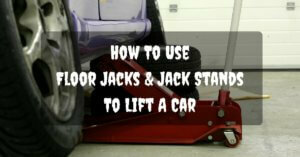 All you have to do is slide the jack under your car and attach the metal rod at the back of the jack. Then you would have to crank the rod clockwise to lift the car up. Once you are done, you will have to crank the same rod in an anti-clockwise direction to lower the car. However, this may take you a couple of minutes and a little bit of energy. Also, there is a chance that you might end up dirtying your clothes. The other type of floor jack and my personal favorite is known as the ‘bottle jack’. This type of jack is comparatively expensive, but more efficient. This is also easy to use as you would only have to place it in the right position and use the rod to raise or lower the car. What makes the bottle jack better and more convenient is that there is a good chance you won’t have to dirty your clothes. 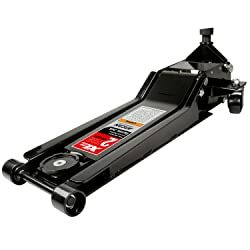 Floor jacks make it easy for you to lift up your car in case you want to change the oil or replace a worn or burst tire. However, it is important that you place the jack at the most appropriate position. You should also ensure you have someone with you while you work on your car. Not placing the jack in the right position can damage your car. More than that, you could be severely injured, if the car drops on you. 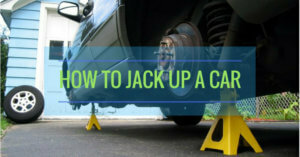 To prevent the car from coming off the jack, people use jack stands. These are tripod shaped tools, which are usually made from heavy-duty metal or steel that you can place under your car once you have lifted it up. You can use this to ensure the car does not fall and hurt anyone underneath it. Most people buy a jack stand while buying a floor jack. 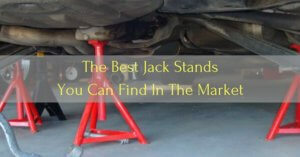 However, you should make sure the jack stand you buy comes with an extremely strong metal body that can easily bear the weight of your car. You would not want to risk your life for saving a small amount of money. There are hundreds of floor jacks available in the market that you can buy. The wide range of options makes it more confusing and difficult for most people to choose the best floor jack and that too in the best possible price. Before buying a floor jack, you should consider some factors including the make, weight capacity, weight, lifting mechanism, and size. The first and most important factor that you must consider is the safety features and how reliable the tool is. You should buy from a well-known and trusted manufacturer to ensure safety. 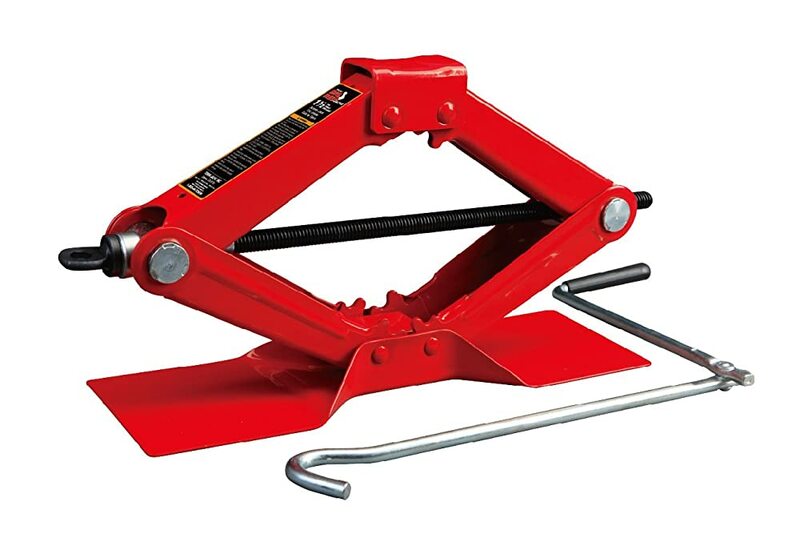 You should consider replacing the factory jacks that come with the car with newer and better ones. If you are confused about which jack to buy, do not worry as we bring you 5 different highly reliable and durable jacks that come with different price tags. You can use them for years just by investing a little bit of cash. These floor jacks cannot only lift your car safely, but also quickly. 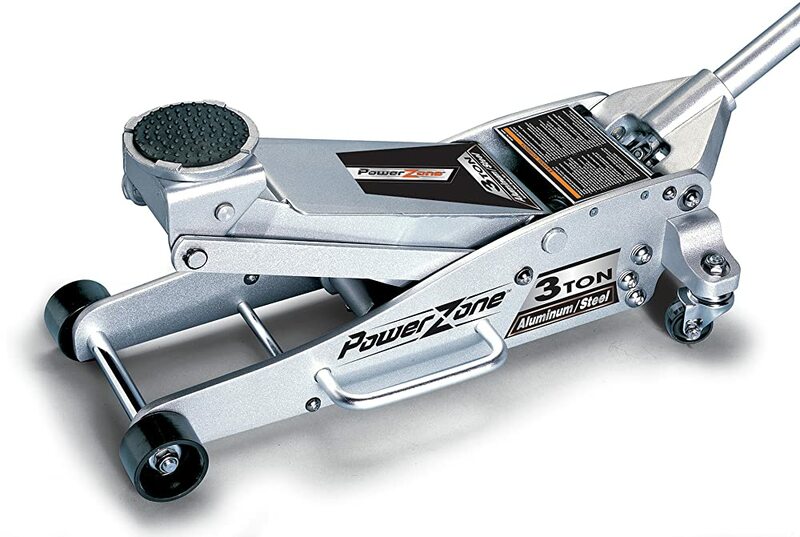 This floor jack by Torin is one of the most amazing floor jacks you can buy. It comes packed with a number of incredible features, including an alloyed steel construction with a heavy-duty steel frame and saddle. The bright red color not only makes it an eye-catching modern-looking tool, but is also covered with highly protective coating, which keeps it from rusting. The four and half-inch wide base offers decent stability and support so you can lift up your car without worrying about the jack moving away. You can use this jack to lift your car up to almost 16 inches. This product is certified, which means it has been strictly checked and tested. It has received an amazing rating of 4.3 stars out of 5, which shows an overwhelming response by the customers. ​This tool weighs only 7.7 pounds and can easily fit in the trunk of your car. ​The wide base allows you to position it conveniently and quickly. The product is manufactured in China and meets ASME standards. However, you should always wash your hands thoroughly after using this tool as it contains a few chemicals that can cause multiple health disorders. You can buy this tool on Amazon. This jack can support up to 6,000 pounds of weight, which makes it one of most heavy-duty jacks available on the market. You can lift your car up to almost 18 inches high using this jack. This height is sufficient to allow you to work under your car easily. The jack weighs 59.1 pounds and is made of a lightweight aluminum frame. The lift arm is made of steel to ensure strength and stability. An advanced safety feature is also added, which prevents the jack from overloading. The quick lifting hydraulic system allows you to lift the car up quickly. ​To ensure there is no damage to your vehicle, this jack comes with a rubber-padded saddle so you can raise your car up without worrying about any dent. Since the jack is a bit heavy, it comes with wheels for easy maneuverability. The wheels also make it easy for you to carry the jack over rugged surfaces. This jack by Powerzone is manufactured in China. It has received an amazing rating of 4.6 stars out of 5 on Amazon, which means a majority customers are quite impressed by it. You can buy this tool conveniently on Amazon. The Hi-Lift Jack X-TREME Jack is an incredible tool, which packs various features. It weighs 35 pounds and has a durable body. The product has been manufactured in the US and is exported to many countries around the world. It comes with 7 to 8-inch holes for easy and durable attachment. While it is recommended for lifting up to 4,660 pounds of weight, this jack can bear up to almost 7,000 pounds of weight, increasing safety by 150%. 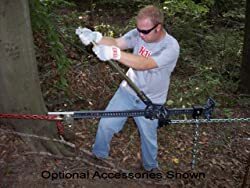 This is the perfect tool you can carry with yourself while going on off-road trips with your friends or family as you would never have to worry about your car getting stuck. This product has successfully impressed most buyers who showed a positive response by giving this product an average rating of 4.5 stars out 5 on Amazon. 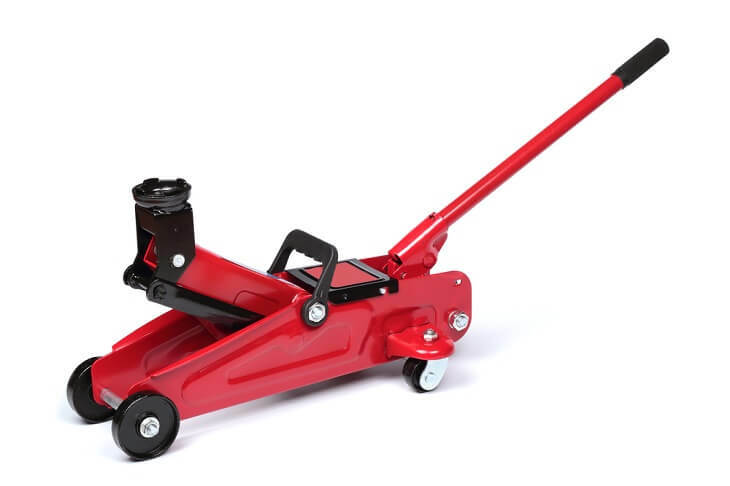 This easy-to-use jack can lift almost all kinds of cars in just 3 to 4 pumps, which makes it one of the fastest jacks available. It was actually designed to serve sports cars, as the fast action would allow professional team members to change tires within seconds. However, it can be used by almost everyone. It comes packed with many features, including a dual parallel pump system. The body is made of aircraft aluminum billet, making this jack powerful. Its lightweight body makes it easier for you to carry it around and even keep in the trunk of your car. ​It also offers a two-piece knurled aluminum handle, which ensures a better grip. The handle also ensures better positioning. ​The compact design takes less ground space, but provides great stability at the same time keeping the car from dropping. It also features a foam bumper to prevent any damage to your car. This jack weighs around 40 pounds and comes with an affordable price tag. It has received a rating of 4.5 stars out 5 on Amazon, making it a highly reliable product. This is one of the best jacks you can buy if you are into car racing. This extremely durable jack by Arcan comes with a 32-inch long chassis and can help you lift your car up to 24 inches. It offers dual pump hydraulic system for fast lifting. You can get your car up in a matter of a few seconds. Accuracy and amazingly precise control is achieved as it features a universal joint release mechanism. This product is safe to use as it complies with ASME standards, which means it has gone through a strict checking process. It offers a sleek and eye-catching design and can lift almost all low profile cars. This feature gets this product an edge over other rival products as most of them fail to slide under lowered cars. It weighs 97 pounds and is still easy to maneuver as it comes with two rear wheels. It has received a rating of 4.6 stars out of 5 on Amazon, which shows a tremendous response from the customers. While all of these floor jacks can get the job done, the 2-Ton Low Profile Steel Jack by Arcan is the pick of the lot. 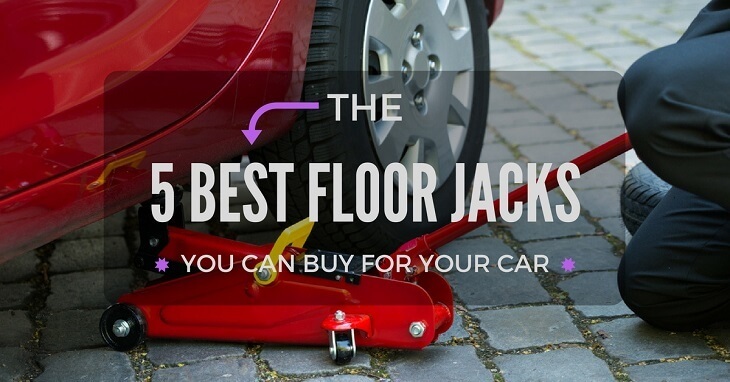 A floor jack is an essential and a must-have tool that you must carry in your car whenever you go for a drive as you never know when you might need it. If you are planning to buy a brand new jack, make sure you buy the one that offers you advanced safety features and suits your car and budget the most. If you have to increase your budget for a decent jack, go for it, as you would not have to think twice before sliding under your car.